Agree or disagree: All ages storytelling is the single most challenging form of creativity. It’s no easy feat, which is why the Toy Story’s or Star Wars of the world are so few and far between. WIth any comic book cartoon, the ability to transcend age is ultimately the single greatest test. It may not be the highest form of universal appeal, but Justice League: Season One is an unqualified all ages success. Of course, all of this preface is largely just me defending the fact that I’m rewatching JL cartoon as an adult. I’m not sure which is harder to defend in a public context – a grown man reading ‘the funnies’ or watching cartoons. Regardless, I thoroughly enjoyed this stroll through Justice League. It’s a fantastic example of how talented writers and animators can smoothly transition classic comic book storylines onto the small screen. The core JL team of this first season is: Batman, Superman, Wonder Woman, Green Lantern (John Stewart), The Flash (presumably Wally West), Hawkgirl, and The Martian Manhunter. After formulating this slightly diversified team, Justice League Season One deftly tackles everything from Superman taking on Mongul on War World to Batman and the JL taking down Lex Luthor’s Injustice League. At the same time, season one branches into some uncharted territory with equal success. In particular, Legends Parts 1 & 2 take half the Justice League to a parallel reality in which the Justice Guild (a parody/reflection of DC’s original Justice Society of America) inhabit a world Green Lantern previously only knew in the comic books of his youth. I won’t spoil anything, but the second episode takes a surprisingly dark turn and raises some complex questions about reality and heroism. In no particular order, season one of Justice League tackles feminism (resolution: Women should be strong like Wonder Woman, but maybe don’t commit male genocide?) and the value of freedom in society following World War II (resolution: Vandal Savage is kind of still a lot like Hitler). It’s a show that would get more ambitious, but already in season one you can see it reaching for thematic meaning. Not much at all. This was fun to watch when I was younger, and it’s equally fun bits of twenty minute comic book morsels as an adult. For parents that enjoy their comics, this is a perfect DVD collection to sit and watch with the kids. If you do feel like putting on your art critic pants for a minute, though, the first season of JL isn’t quite as on the side of the intellectual as it will become. Although I laughed a lot throughout these 26 episodes and 4 discs, the majority of the laughs were at awkward silences or silly animations gone wrong. Or, most likely, at Superman getting rocked in every single battle. Again, though, when scaling an animated series into the All Ages realm, there’s going to be a clear drive towards kid-friendly humor. This means you’ll have to sit through some cheesy Flash jokes (the team’s only wisecracking hero) before you can get to the next cold stare from Batman. Should You Buy Justice League Season One? 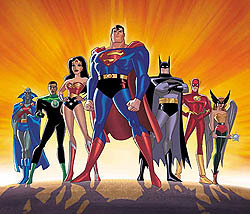 For everyone clamoring for a Justice League movie from DC, let’s take a step back and remember DC’s animated Justice League was one of the best comic book cartoons of all time. While I think fans of the Justice League will enjoy this DVD collection, I would clarify how exactly JL’s animated run continues before making a purchasing decision. This is the first of 4 DVD volumes – Justice League Season 2, Justice League Unlimited Season 1 and JLU Season 2 follow. This gets mildly confusing as the show rebrands to Justice League Unlimited after the second volume of Justice League. Your best bet from an economic and value standpoint is to purchase the complete Justice League set available on Amazon. That said, I bought this first standalone volume to make sure I’d enjoy owning these DVDs, and I definitely do. The packaging of this first season is very nice, with all 26 episodes clearly delineated by disc on the case.